What are Teeth Implants in One Day? Tooth loss rates have increased significantly since 1970. This trend will probably continue to accelerate. Many Millennials are already dealing with tooth loss or similar issues. Fortunately, missing tooth remedies have increased exponentially since the 1970s. Back then, even if your tooth was only damaged it, removing it and replacing it with a denture was pretty much the only option. Dentures may still work today, but there are many other choices as well, including new teeth in a day. But wait, what’s the catch? To answer this question, we need to look at the complete dental implant process. Implants are artificial teeth which look and act just like your natural ones. A natural tooth has a root, pulp (invisible part of the tooth above the gumline), and crown (visible part of the tooth. Similarly, an implant has a root (titanium post), abutment (cap on the post which holds the crown), and a crown. Dr. Stone begins by placing the titanium rods into your jaw. Then, there’s about a three week waiting period while osseointegration occurs. This process is natural bone growth around the titanium rod. The more osseointegration takes place, the more natural the teeth will be and the easier it will be to fit the crown. This crown is laboratory-fashioned, so it mimics your remaining teeth in terms of shape and color. Many people don’t want to wait three weeks for the complete process. So, Dr. Stone can fit a temporary crown onto the abutment. The tooth will not be as strong and it will not look exactly like your other teeth. But it will do for a few weeks, especially if you want or need teeth implants in one day. So, watch out for prosthodontists who make big promises like “get a new smile in just hours.” These claims may just be temporary implants. However, some dentists, especially in Cuba and other places outside the United States, use extremely cheap materials to get the job done quickly. After a procedure like that, you’ll probably be back in the dental chair in just a few months. Teeth implants in one day are not for everyone. For example, some people do not have enough bone mass to support even a temporary crown. That’s especially true if the tooth has been missing for a while. Bone tissue resorbs (melts away) very quickly. Teeth implants in one day may be available at Best Dental Associates. 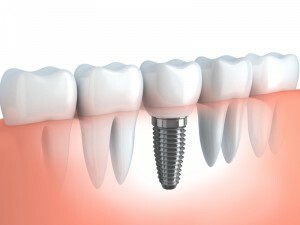 Dr. John Stone uses this process to jump-start your permanent implant procedure and improve your appearance right away. Call us today and make your initial appointment.